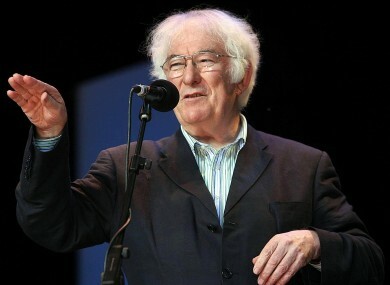 BELOVED POET SEAMUS Heaney will be laid to rest in his native Derry on Monday. Funeral arrangements for the 74-year-old, who passed away unexpectedly yesterday after a short illness, have been announced. A removal to the Church of the Sacred Heart in Donnybrook, Dublin 4 will take place Sunday evening, 1 September at 6.45pm. The Funeral Mass will be held Monday morning from 11.30am before a burial at Bellaghy Cemetery in Derry at about 5pm. Heaney is survived by his wife Marie and children Michael, Christopher and Catherine Ann. The death notice of the Dublin resident also mentions his late siblings Sheena, Ann and Christopher. A Book of Condolence will be opened by Dublin’s Lord Mayor in the Mansion House at 10am Monday morning. The public will be able to sign it between 10am and 5pm on Monday, Tuesday and Wednesday. Another Book of Condolence has already been opened in the Guildhall in Derry for the citizens of the city to pay respect to their local hero. In Belfast, a Book of Condolence will open at City Hall on Monday from 9.30am. Since news of the Nobel Laureate’s death yesterday, people have been sharing their memories and favourite poems across social networking sites. The Taoiseach and President led tributes to “the keeper of our language“. Email “Funeral arrangements for Seamus Heaney announced”. Feedback on “Funeral arrangements for Seamus Heaney announced”.